These little treats are from a fabulously simple recipe that we like to customise and adapt, depending on what flavours we fancy at the time. Here's the basic recipe for the pecan and maple syrup variety you might like to try at home. Grind the granola or biscuits in a blender and mix with the melted margarine. Press down to line the bottom of approximately six small containers such as those in a muffin tin, or one larger round container, forming a 'biscuit base'. Blend together the tofu, oil and syrup until smooth and pour onto the biscuit base(s). Cook in a 180C/350F/Gas Mark 4 oven for approximately 40 minutes until well risen and turning golden brown. 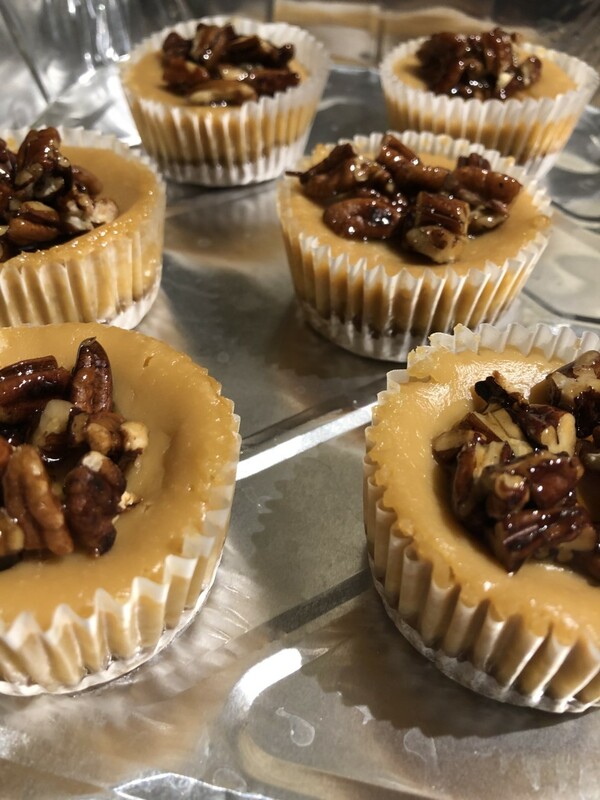 Leave to cool slightly, and top with the toasted pecans and a little drizzle of maple syrup to decorate.